Living paycheck to paycheck is one of Americans' money fears — but it's not their biggest one. 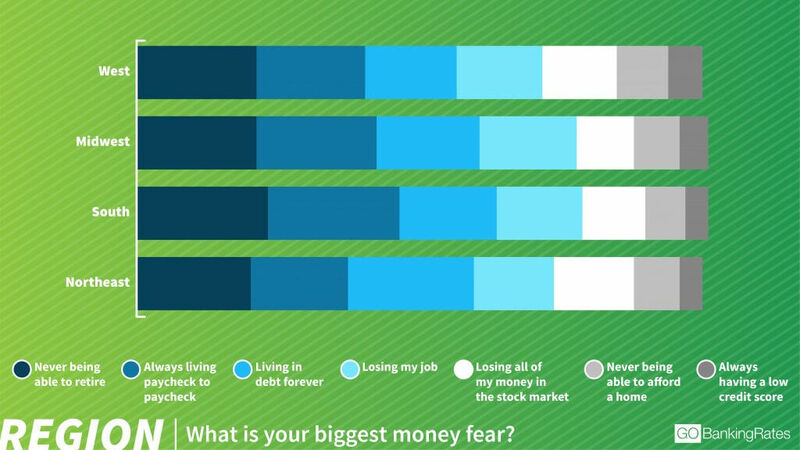 When GOBankingRates conducted its 2015 Life + Money Survey, Americans’ top money fear at that time was always living paycheck to paycheck, with 20 percent of respondents citing this response. The No. 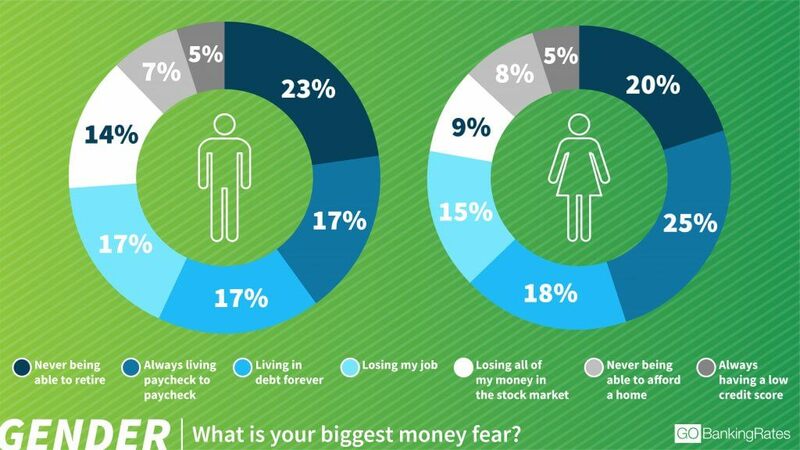 2 fear was living in debt forever, and never being able to retire was the third most common worry. But that’s changed — slightly. Americans now have a new No. 1 financial fear, a 2017 GOBankingRates survey found. Although this survey specifically asked people to reveal their money fears, GOBankingRates also found that these aren’t just fears — they’re also the reality for many Americans. Read on to find out why and to learn more about how financial worries have changed over the last few years. Still, never being able to retire seems to be a growing fear among all Americans, with roughly the same percentage (approximately 20 percent) of people from each region choosing this option in the 2017 survey. But in 2015, GOBankingRates found that “never being able to retire” was only the No. 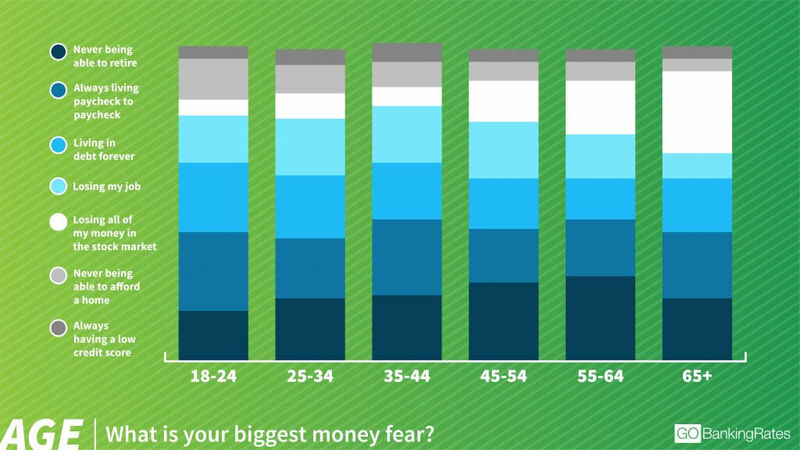 3 money fear, with 16 percent of those surveyed citing this response. Why are more Americans afraid they’ll never be able to retire in 2017 compared to two years ago? There are many reasons, said Scott Bishop, executive vice president of financial planning at STA Wealth Management in Houston. For one, the decline in employer pension plans has some people worried about being able to build a large enough nest egg on their own. “Many feel that they will not be able to count on Social Security, as they fear it is going bankrupt,” said Bishop. Retirement fears are even greater among Generation X and baby boomers. The survey found that 25 percent of adults ages 45 to 54 and 27 percent of adults ages 55 to 64 said never being able to retire is their top fear. “Most baby boomers and even Gen Xers have been through at least two bear market cycles and are worried about market corrections in retirement,” Bishop said. Plus, they’re likely more worried because their parents are already in retirement, and they see the issues they’re dealing with, he added. For example, some Americans see their parents struggling to make ends meet because they didn’t save enough or are being hit with high healthcare costs. And, in some cases, they’re supporting their parents financially. However, the most likely reason many Americans are worried that they won’t be able to retire is because they just aren’t saving enough, in general. “Since most are living paycheck to paycheck — and since almost everyone saves less than 10 percent of [their] salary — they fear they can never retire,” Bishop said. The GOBankingRates’ 2017 Retirement Savings survey found that 34 percent of Americans have $0 in retirement savings. Another 21 percent have less than $10,000 saved. 40 percent of Americans who don’t have retirement savings said it’s because saving for retirement isn’t a priority. Meanwhile, 39 percent of Americans don’t know how they’re paying for retirement. And, less than half of Americans think they will retire in their 60s. Twenty-six percent think they won’t retire until they’re in their 70s — or later. Based on these results, it’s very likely that many people will not be able to retire when they want. Can Americans Overcome Their Retirement Fears? To reduce your fear about never being able to retire, figure out how much money you need to retire and create a plan to reach that goal. Aim to save 20 percent of your annual income, said Byrke Sestok, a certified financial planner with Rightirement Wealth Partners in White Plains, N.Y. If that’s not possible, contribute enough to your workplace retirement plan to get your employer’s full matching contribution (if it offers one). An online retirement calculator can give you a general idea of how much you need to save. Investment firms such as Fidelity and Vanguard have free calculators, or you could use the ESPlannerBasic online calculator. And ideally, you should meet with a financial planner to develop a plan, said Bishop. You can find one through the National Association of Personal Financial Advisors at NAPFA.org or the Financial Planning Association at OneFPA.org. But the key to overcoming this financial fear is to just get into the habit of saving — even if you have to start small, said Sestok. As you start to see your savings grow, your confidence in your ability to save enough for retirement will increase. The percentage of Americans who fear making ends meet actually hasn’t decreased since 2015. In both the current and 2015 survey, 20 percent of respondents said always living paycheck to paycheck is their top fear. Although the economy has been recovering over the past several years since the Great Recession, wages haven’t grown much, said Bishop. However, consumers are spending more. And although inflation has been low, people are having to pay more for some big-ticket items, such as healthcare and education, he said. As a result, they’re having a harder time stretching their paychecks. In fact, another recent GOBankingRates’ survey found 49 percent of Americans are indeed living paycheck to paycheck. So, it’s surprising that more people didn’t name this as their top fear. However, the fear is alive among female respondents. The survey found women are more likely than men to name “living paycheck to paycheck” as their No. 1 financial fear. 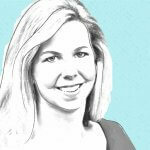 Twenty-five percent of women said always living paycheck to paycheck is their top fear, versus just 17 percent of men. Both Bishop and Sestok agree that women are more likely to have this fear because they’re likely more aware than men of how tight the household budget actually is. “Since, in my opinion, women are better planners, they actually see the problem of working paycheck to paycheck,” said Bishop. To stop worrying about living paycheck to paycheck, Americans should start by figuring out where their money is going. Sestok recommends creating a balance sheet that shows your assets (what you have) and your liabilities (what you owe). This is your financial baseline that shows you the big picture of where you stand and gives you an idea of what you need to do to improve your situation. Then, take a closer look at where your money is going on a daily basis by reviewing your checking and credit card accounts. You need this information to create a budget that will keep your expenses in line with your income. “Those who complete this exercise are now in a position to make spending and saving changes,” he said. You’ll realize you can finally stop struggling to make ends meet by eliminating your unnecessary expenses. 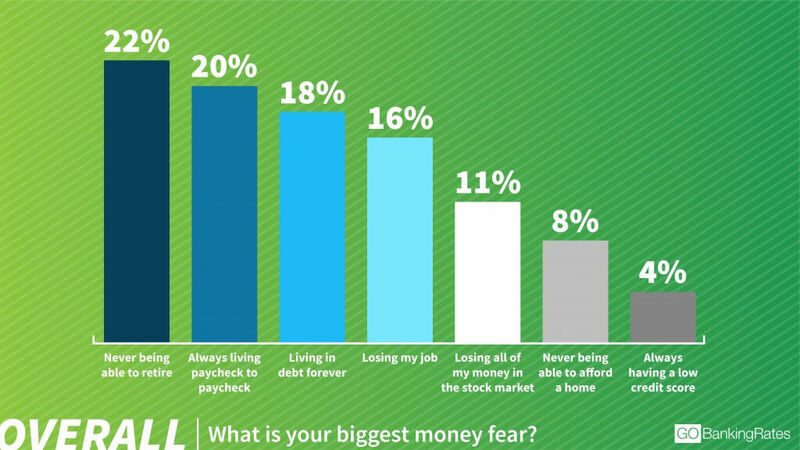 As with living paycheck to paycheck, the same percentage (18 percent) of Americans chose “living in debt forever” as their biggest money fear in 2015 and 2017. It’s not surprising that debt is still one of Americans’ top money fears, especially because GOBankingRates’ 2016 Debt survey found that 49 percent of Americans are in debt. However, the fear of living in debt is even greater among millennials. According to the new survey, 22 percent of adults ages 18 to 24 and 20 percent of adults ages 25 to 34 named this as their top money worry. Sestok said the fear is likely linked to student loan debt. The GOBankingRates’ debt survey found that student loans are the biggest source of debt for millennials, with 36 percent of 18- to 24-year-olds and more than 40 percent of 25- to 34-year-olds owing money for higher education. The median amount owed among both age groups is $10,000 and $14,000, respectively. Millennials are also more likely to be worried about living in debt because paying off debt can be hard on a low starting salary, Sestok said. But as income grows with age, living in debt becomes less of a concern because you have more money to pay down your debt. Although it might seem impossible, more Americans can start living a debt-free life — as long as they take the appropriate steps. For example, paying off the smallest balance first can create a sense of accomplishment and encourage people to tackle bigger debts. Another smart strategy to pay off debt is to focus on the loan or balance with the highest interest rate first to reduce the interest — and therefore, the total amount — you pay over time. Staying out of debt, however, requires a lifestyle change. It’s one thing to have racked up debt to pay for college. It’s another thing if your debt came from living beyond your means or letting emotions spur your spending. In these cases, Americans might need professional help to curb their spending habits. Methodology: This GOBankingRates survey asked 2,584 people in the U.S., “What is your biggest money fear?” Respondents could choose one of the following: never being able to retire, always living paycheck to paycheck, living in debt forever, losing my job, losing all of my money in the stock market, never being able to afford a home or always having a low credit score. Responses were collected through a Google Survey from June 28, 2017, to June 30, 2017. Responses are representative of the U.S. online population. The survey has a 3.6 percent margin of error.